The hosts are currently bottom of the Euroleague and they have been eliminated from the race for the playoffs. The away side are currently in the playoff spots but there isn’t much space between themselves and the teams pushing to break into contention, so they know that this game provides them with a chance to solidify their position and build confidence for the rest of the run in. 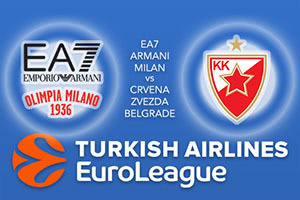 These two teams have only met once in Euroleague action so far and that came earlier on this season. The side from Belgrade triumphed at home, winning by 83-70l with Marko Simonovic offering 23 points in the win. Milan have a number of players who can cause damage, and it has been a disappointing campaign for the Italians. With players like Rakim Sanders offering 13.1 points per game and Kruno Simon providing an average of 11.1 points per game, Milan should have performed better. However, the fact that these are the two players who have broken into double figures, it says a lot about what Milan has endured this season. Simonovic has led the way this season for Crvena, offering an average of 13 points per game this season, but he is the only player who has broken into double figures. Ognjen Kuzmic has provided an average of 9.6 points per game while Charles Jenkins has notched an average of 9.1 points per game. The Zvezda defence is high regarded and they have the second best record with respect to points allowed, 74.7 per game. Of course, Milan actually have a good offensive record, despite their lowly placing, and the 82.3 points per game they have achieved is the fourth best in the league at the moment. The Milan defence is the big issue for the team, so they need to improve on that next season. The inventive to win lies with the away side and you can back Crvena Zvezda mts Belgrade to win at -3.5 which is provided at odds of 1.90. When it comes to the Over/Under market, look to go OVER 161.0 at odds of 1.90. Bet Now!